DALLAS – Shoulder to shoulder they fought, steeled against the chaos and violence that threatened their lives on a daily basis. Decades after the end of the Vietnam War, many veterans have lost contact with their “Battle Buddies.” But few have forgotten them. That’s why last fall, as part of the Exchange’s participation in the 50th Anniversary Vietnam War Commemorative Partner Program, the Exchange asked veterans to submit essays detailing their time fighting alongside their favorite “Battle Buddy” for a chance to win $1,600 in prizes. This month, the writers of the top three essays were awarded $1,600 in prizes. The grand prize winner, Elbert E. Clayton of O’Fallon, Illinois, won a $500 Exchange gift card for his essay on “Pete,” with whom he served in February 1962 at Tan Son Nhut Air Base. Clayton was awarded his prize during a ceremony held Jan. 20 at the Scott Air Force Base Exchange. Second-place winner Nicholas W. Leopoldus, of Biloxi, Mississippi, was awarded a Schwinn 270 recumbent bicycle during a ceremony held Jan. 21 at the Keesler Air Force Base Exchange. Leopoldus wrote of 2nd Lt Ronald Charles Osborne, whom Leopoldus served with during a search-and-destroy mission a few miles from Cambodia in Vietnam. Obsorne was killed in action by a claymore mine while outside the perimeter preparing for an anticipated nighttime attack by North Vietnamese forces. Third-place winner Jerome D. Witt, of Roy, Washington, won a Schwinn 170 upright bicycle for detailing his time with Ernie Sapp, with whom he lost contact after a year of “living on the edge” together as part of a four-man recon team. Witt was awarded his prize Dec. 23 at the Joint Base Lewis-McChord Exchange. The 50th Anniversary Vietnam War Commemorative Partner Program was designed for federal, state and local agencies to thank and honor Vietnam veterans and their families. DALLAS – Throughout 2016, the Army & Air Force Exchange Service will continue its Because of You program, expanding it to honor not only service members but also their families. The Exchange launched Because of You in 2015, using monthly contests to reward authorized shoppers while saluting the military through themes that honored active-duty service members. Last year, the Exchange and vendor partners awarded more than $175,000 in prizes, including Exchange gift cards, trips, MILITARY STAR® card statement credits and more. In 2016, the program will continue to honor service members while celebrating the contributions of the military family. Themes will focus on military spouses, children, parents, veterans—and even pets. The Exchange is planning several contests throughout the year to support the program, with the first contest expected to kick off in April. DALLAS – The Army and Air Force Exchange Service knows that Soldiers, Airmen and their families are the experts on how to best improve the Exchange shopping experience. That’s why the Exchange is inviting shoppers to sound off on their experiences 365 days a year with a new Customer Satisfaction Survey, located at https://surveymonkey.com/s/MyExchSurvey. Previously, the Exchange gathered shopper feedback through its twice-yearly, store-level Customer Satisfaction Index, which was administered by an outside company. The new survey is performed in-house, allowing the Exchange team to view responses in real time and respond to areas of concern immediately. Moving the survey, as well as the Exchange’s internal employee survey, in-house will save the Exchange about $730,000 per year in fees to the former outside service provider. 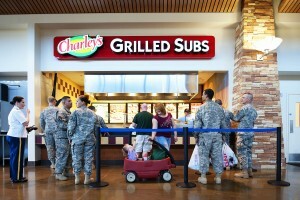 DALLAS –The Army & Air Force Exchange Service is making it easier for service members and their families to stick to their health-related new year’s resolutions while dining or grabbing a snack on the installation. Around the world, Exchange food courts and Express locations are stocked with healthy options for smart choices on the go. Popeyes Louisiana Kitchen offers a live-well menu with more than 20 items with less than 350 calories. The blackened chicken entrée salad is exclusive to the Exchange at only 300 calories, while a chicken and sausage jambalaya is just 220 calories. Popeyes operates more than 75 Exchange locations on Army and Air Force installations. When dining at one of the Exchange’s 200 Charleys Grilled Subs locations, military shoppers will find a variety of items with 150 calories or less, including grilled chicken, steak and garden salads. Charley uses 100 percent USDA choice steak, 100 percent all-white meat chicken breast and fresh deli meats. Subway is also taking wellness to heart by offering a Heart Healthy menu that includes meals less than 700 calories with 30 percent or less calories from fat. Subway is the first restaurant to receive the American Heart association Heart Check. The Exchange operates 206 Subway restaurants. Besides food court staples such as Subway and Popeyes, the Exchange is enlisting new restaurants to keep the focus on health. In 2015, the Exchange added Freshens restaurant to its portfolio. Freshens is known for health-conscious offerings such as crepes, salads, rice bowls, flatbreads, smoothies and yogurt. Locations and opening dates are still being finalized. For customers who need to grab a quick bite, Expresses offer good-for-you choices for on-the-go snacking and light meals. Snack Avenue is a special area inside Express stores specifically geared to customers looking for a quick healthy meal or snack. Expresses have added several new items to Snack Avenue including Fiji water, bottled smoothies, juices and hard-boiled eggs. DALLAS – Military shoppers can start off the new year with extra spending money thanks to the Army & Air Force Exchange Service’s latest contest with Hershey. With the Reese’s Pandemonium sweepstakes, six shoppers will win a $500 Exchange gift card. Through Jan. 25, shoppers can enter at www.shopmyexchange.com/sweepstakes. The Reese’s Pandemonium sweepstakes drawing will take place on or about Jan. 26. No purchase is necessary to enter or win. DALLAS – The Army & Air Force Exchange Service announced today that barracks and dorm residents at 14 additional CONUS installations can now enjoy Exchange CONNECT high-speed Internet and digital TV service. The award-winning service powered by Boingo Broadband was already operational at 15 Army and Air Force installations across CONUS. Exchange CONNECT offers instant high-speed Wi-Fi and digital TV service for barracks and dorms residents starting at $29.95 a month. There are no contracts, hidden fees or cancellation charges, and no installation or special equipment is necessary. In addition, the service is portable and moves with the service member to other Exchange CONNECT locations. Monthly subscribers receive unlimited free access to the Internet via Boingo’s global network of more than 1 million Wi-Fi hotspots worldwide. Boingo recently tailored its TV service to better meet the interests and needs of enlisted military with the launch of an attractive new package called Core TV. This package features a targeted tier of HD-quality programming popular with service members, all available to stream on any mobile device for just $19.95 per month. Boingo Broadband services are also available at United States Marine Corps (USMC) locations nationwide. DALLAS – The Force was strong with troops deployed to the Middle East this holiday season as nearly 11,000 service members and Department of Defense civilian employees attended downrange screenings of “Star Wars: The Force Awakens,” courtesy of the Army & Air Force Exchange Service and Disney. In all, 75 screenings were held between Dec. 20 and 28 at installations in Afghanistan, Iraq, Jordan, Kuwait and the United Arab Emirates. Some events featured costumed patrons, photo ops and trivia contests. Attendance was strong enough in Iraq to warrant overflow seating or additional showtimes at three of the screening locations. Ken Caldwell, senior vice president of North American sales and distribution for The Walt Disney Studios, appeared at screenings in UAE and Afghanistan to thank troops for their service and pass out special Star Wars Military coins to service members. Caldwell was personally escorted into Afghanistan by Sgt. Maj. Keith Craig, senior enlisted advisor for the Exchange in the Europe/Southwest Asia area. Screenings were held at 12 different installations, starting with Camp Al Minhad in Dubai on Dec. 20 and ending on Dec. 28 at Al Asad Air Base, Iraq. “Star Wars: The Force Awakens” is one of the latest in a long-running series of first-run film screenings brought to troops by the Army & Air Force Exchange Service. DALLAS – The Army & Air Force Exchange Service and Mars/Wrigley are making game day extra sweet for military shoppers this year by giving them the chance to win one of 20 Exchange gift cards valued at $50 each. Through Jan. 25, shoppers can enter the MARS/Wrigley Super Bowl Sweepstakes at www.shopmyexchange.com/sweepstakes. “Best buds? Check. Big-screen TV? Check. Fully loaded snack bar? Double check. The only thing that’s missing is $50 in spending money to kick your party up that extra notch, courtesy of the Exchange and Mars/Wrigley,” said Chief Master Sgt. Sean Applegate, the Exchange’s senior enlisted advisor. The MARS/Wrigley Super Bowl Sweepstakes is open to authorized shoppers 18 and older. No purchase is necessary. Winners will be notified after a drawing on or about Jan. 31. DALLAS – The Army & Air Force Exchange Service has been named a 2016 Top 100 Military Friendly® Employer by Victory Media, publisher of G.I. Jobs and Military Spouse magazines. The 13th annual list ranks companies based on their long-term commitment to hiring veterans, retention programs for veterans and policies on National Guard and Reserve service. The Exchange hired 1,208 veterans worldwide in 2015, and 10 percent of Exchange’s 35,500 associates are veterans. To recruit veterans, the Exchange partners with the Employer Support of the Guard and Reserve, Wounded Warrior Project, Operation Warfighter Program, White House Joining Forces and Feds Hire Vets. The Exchange, which was ranked No. 40, up from No. 71 in 2015, was featured along with other companies earning the Military Friendly® Employer designation in G.I. Jobs magazine’s December edition.